Angels on a memorial plaque. Now, 32 visitors are online. Two angels on a commemorative plaque for a young adult. To put on the grave. A funeral plaque with two lain angels. 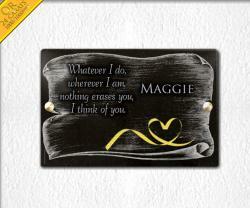 This is a black granite plaque for a young adult. There are two angels. An angel is often a representation of a young person, and in the funeral it is usually used for a late child. It is also the symbol of a divine protection which protects the deceased. This is a symmetrical plaque as the two angels are the same. 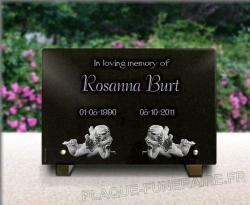 As the plaque is black, it can be laid on every type of grave, the colours will go together. 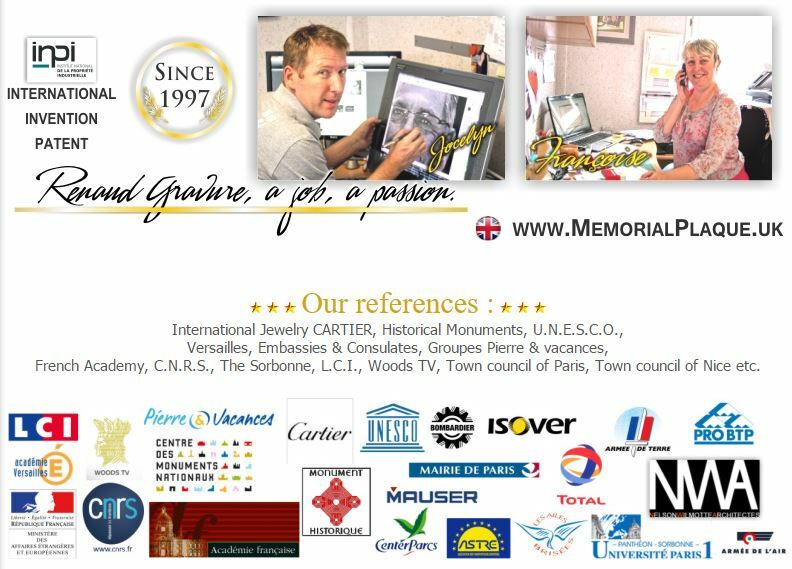 At Renaud Gravure, contrary to other funeral companies, we only use mineral material, glass or granite. 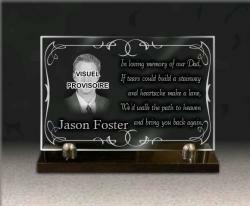 Plaques in plastic, PVC, metal are not as resistent as is granite. The companies has been opened open since 1997, and only has worked in the funeral. Thus we truly know what is good and resistent for being in a cemetery. This is why we sell granite plaques on aluminium feet. The aluminium is stainless, so it won't damage the tomb. This example is one of our small plaque to put, but there are also bigger plaque, and even adhesive plaque or drilled to screw on a headstone. It is a black plaque. There are some lines of text and angels. Everything is centered. At the top it is written "In loving memory of", below "Rosanna Burt" and in the middle the two dates "01-05-1990 05-10-2011"
Dates and the first line are in the same font, quiet straight. The name has a very big size, is in italics. The two angels are lain, the feet are up in the air. A foot behind the other. Their head relay on a hand. They are peaceful and thinking. Their wings are opened, and they are naked. It is the same angel, one looking to the right, and the other to the left. It is like a mirror. They are at the bottom of the plaque, between the screws which hold the feet. Let us explain you where you can find the elements that are on this plaque. For the texts you have to create three texts. One for each line, because in this case, they are not in the same size nor the same font. The first sentence and dates are in the font called "Style 6". Names are in "style 2". To create a text, click on "Texts" ; "Create text #--". A pop up will open, and you just have to follow the indications. The third thumbnail will help you to place the text and modify its size. For the angels, they are two patterns from our catalogue of "High definition drawings". It is easy, you click on this thumbnail, then on "Create drawing 1", and in the menu that will show up, click on "Angels and fairies". To be sure the two angels are in the same size, we give you this advice. In the thumbnail "2: Size, position and rotation" there are some numbers about the position of the the first angel, and its size. Remember them or note them because when you will create the second drawing, you will have to repeat those figures.